Just in case you, like me, feel the need to look at evidence that it’s not freezing cold and snowy everywhere. Has anyone successfully grown the Romanesco cauliflower/broccoli? It’s so architecturally beautiful. *Not for GIEI. I wish we had foreign correspondents. Hi! I'm from Italy, northern part, and no, it's not really the weather cold. I have started spring works on my organic garden, just clean and put in place of course, it's not SO hot temperatures. This year I will try to grow broccoli and cauliflower, as well as mizuna, pack choi and kohlrabi. Good luck with your garden, Gabriel. Here, it's about -11C (11F) at the moment, so anything even vaguely springlike sounds good to me. In response to your Q, Theresa Mycek, grower/manager of Colchester Farm CSA, grew some very nice romanesco last summer, and harvested it in early-mid fall. Its flavor is mild; it's very nice raw — in salad, dip, a snack — as well as steamed with a little gorgonzola on it, lemon, mustard-and-garlic sauce, or in soup.. good stuff. I tried to grow romanesco last year. I started the seeds indoors and transplanted in spring, probably April. I got great big plants, over 3 feet tall, but they never grew heads. My regular broccoli, started and planted at the same time, grew as expected. Any thoughts on why nothing came of them? 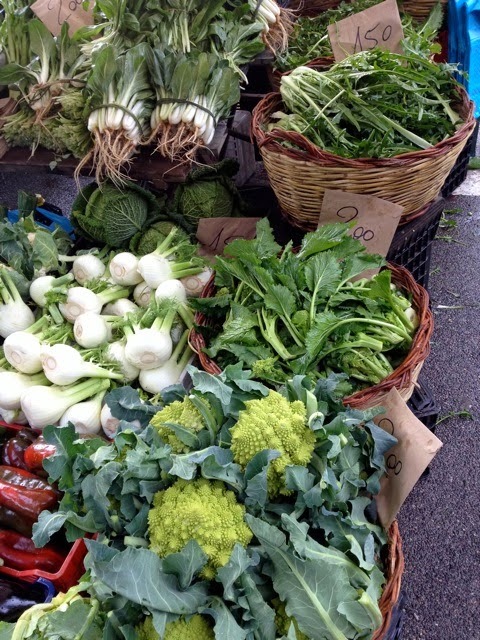 Hi Larry – I hear from Kent Phillips, who grew it successfully, that it takes longer to get to maturity than regular broccoli, so that might have been the issue – not enough time before summer weather. Kent grew his starting in July for fall harvest.